Since the 1980s, the awareness of lead pollution has been increasing at the same rate as the scientific proof of the devastating effects caused by this heavy metal on nature and human health. The common goal is to get as near as possible to a "lead-free" world by introducing tighter restrictions for any human activity involving lead. A2F contributes to this by changing the way taps are manufactured, replacing traditional brass components (a material containing lead) with stainless steel. The constantly growing environmental awareness that globally encourages mankind to reconsider its relationship with the environment and nature, over time has prompted the health and environment authorities to ban (or limit) the use of substances considered highly toxic to humans, such as lead, nickel and chrome. Unfortunately traditional brass taps contain substances such as lead and nickel that leak into the water which flows through them and is subsequently ingested by the user. They are also (through the chrome plating process) detrimental to the precarious ecological equilibrium of our environment. Some countries, mindful of these facts, have already banned the use of these substances from the production of taps for domestic use. Recently in Northern Europe (notably Denmark and the Netherlands) the problem of nickel leakage in drinking water from chromed brass taps was signalled as requiring the creation of a special European working team (CEN TC 164 WG3 AHG5) in charge of identifying reliable measures to limit the quantity of nickel in drinking water. Such an initiative was due to the fact that a greater number of people display intolerance (allergy) to some metals and especially to nickel. Such intolerance is so widespread (and sometimes severe) that a car manufacturer as important as Volvo decided to run an advertising campaign (January 2009) that states that the interiors of their cars are made with materials with low release of nickel. Chrome is a hard, shiny, corrosion resistant metal, widely used to plate and protect the surface of other, less resistant metals. Chrome does not present problems directly associated with the use of a tap, but we are now aware of the detrimental damage to the environment and human health by use of hexavalent chromium, a substance that has only recently been acknowledged as highly carcinogenic and consequently banned. An alternative type of chrome called "trivalent" is now being used to chrome plate taps. This substance has not yet been proven to be non-toxic but the plating processes continue to have a strong negative impact on the environment (harmful alkaline and acid gaseous emissions, high water consumption and the presence of toxic materials in disposed water and sewage sludge). As an example, in Italy alone about 2200 tons of carbon chromic acid is used every year and during the chrome-plating processes about 80% of the chrome ends up in industrial waste water. Add to this the considerable quantity of water required for the chroming process and the fact that it is returned heavily polluted into the environment, and it would seem that the definitive solution is clearly to produce taps and fittings from a material that does not require chroming. The most widely known reactions to nickel are caused by contact with the metal but the most dangerous are through the ingestion of nickel leaked in drinking water by chrome plated brass taps. 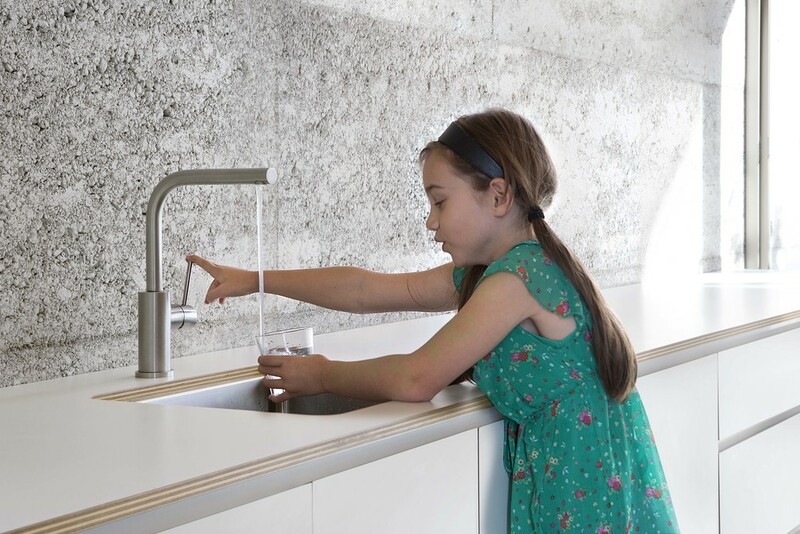 By using stainless steel A2F ensures that no nichel is released into the water by the tap. The tap is often considered an item of secondary importance and aesthetic appearance is sometimes the only concern. A2F invites you to also consider how important a tap is in terms of hygiene, health and ecology. Every day we use our kitchen tap to supply water to drink, cook and make coffee or tea. According to statistics a person consumes 5 litres of water on a daily basis just for drinking and cooking. That amounts to almost 2,000 litres per year. Does such a quantity warrant the selection of a tap that is non-toxic, hygienic and totally healthy? Most taps on the market are produced from brass and thus contain a certain percentage of lead. Lead is a highly toxic heavy metal and the dangers from exposure to it are now well known. This metal, used for many years to manufacture household items and everyday objects, is gradually being banned because of its harmfulness (e.g. elimination from gasoline, paints and electronic devices). Children are the most susceptible to lead poisoning as it impairs psycho-physical development by damaging brain cells. Legislative provisions which refer to the protection of human health from exposure to lead are progressively being updated. The World Health Organization (WHO) sets the maximum "suggested" level of lead in drinking water at 10 micrograms per litre, a limit that from 2013 onwards will become obligatory. Today the limit is set at 25 micrograms/litre, even though this is a theoretical limit that few are able to verify and comply with. IA traditional brass tap leaks from 80 to 100 micrograms/litre of lead in its first week of use, a concentration considered toxic for the human body. Even after several years of use a brass tap will continue to leak a considerable quantity of lead. Some countries, such as California in the USA have adopted very strict measures to eradicate the presence of lead in products that come in contact with drinking water. In January 2010 the State of California passed a law known as "AB 1953" that forbids manufacturing, commercialization and use of products that contain lead and are intended for the distribution of water for human use. A2F believes that in the foreseeable future all countries will pass similar laws. Consider that many of the objects manufactured for the health care sector(where hygiene must be strictly guaranteed) as well as the food , wine, cleaning and pharmaceutical industries are made of stainless steel. So why not produce taps with this material? Stainless steel is extremely hygienic because it presents a surface with a high density and without porosity. Such characteristics stop the proliferation of bacteria, which can be harmful to our health. Stainless steel is environmentally friendly as it does not contain lead and does not leak nickel. It is resistant to corrosion and therefore does not require additional protective coatings, such as chrome-plating, which are heavy pollutants. It has a high mechanical resistance and therefore guarantees long life to the objects for which it is used. Stainless steel is by far the best material to use in the production of taps for drinking water. “Stainless steel" is categorised in many different types and grades and for the production of taps the two grades universally considered best are the ones identified as AISI 304/304L and AISI 316/316L. Other types such as AISI 303 (used by some manufacturers to reduce costs) do not guarantee the same quality in terms of resistance to corrosion in contact with drinking water. It is also worth highlighting that there are products on the market which, although “made of stainless steel AISI 304” actually still allow water to flow in contact with brass (these taps are in fact covered in stainless steel but their inner mechanisms are made in brass). A2F taps are produced with 100% AISI 304 stainless steel and proudly display the GENUINOX brand.